Leading Japanese computerized flat knitting machine manufacturer Shima Seiki will exhibit at the upcoming Expotextil Peru 2014 show in Lima, Peru this month. 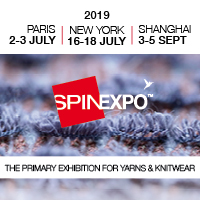 On show will be the company’s SSR112 series workhorse flat knitting machine that inherits the know-how and experience accumulated over the years by the leading manufacturer of computerized flat knitting machines. The SSR112’s productivity is increased with a maximum knitting speed of 1.2 metres per second, as well as with the R2CARRIAGE System that achieves quicker carriage returns. It also carries over proven Shima technology such as the patented Digital Stitch Control System (DSCS), spring-loaded Full-Sinker System, Stitch Presser, Yarn Gripper and Cutter and Takedown Comb. Made-in-Japan quality, reliability, productivity, user-friendliness and cost-performance combine to satisfy the high standards expected by the fashion industry within Peru and beyond, the company reports. Also on display will be the SDS-ONE APEX3 3D design system. Key to Shima Seiki's Total Fashion System concept, APEX3 integrates all stages of apparel production into one smooth and efficient workflow through comprehensive support from planning and design to production and sales promotion. With ultra-realistic product simulations, APEX3 is also capable of Virtual Sampling that minimizes the costly time- and resource-consuming sample-making process.